Thunder rumbled and rain and hail dashed against our hotel window during the night, waking us up. Morning dawns gray and wet with promise of more rain and thunderstorms. In the warmth and wetness, some of the trees are beginning to leaf out, a touch of green in the murkiness. With the sun a sliver in the overcast, we join the morning commuter traffic edging into Madison. We travel down Mineral Point Road, passing the huge Oakwood Lutheran Home with its vast green lawns and spring-green trees. 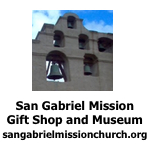 We also pass one of the five Frank Lloyd Wright structures, houses, churches and civic buildings in the Madison area. We travel by a large park built around Mendota Lake, one of the largest lakes in Wisconsin. . Seagulls and Canada geese rest on the grass, preening and feeding. The lake freezes over in winter and supplies good fishing in the other seasons. 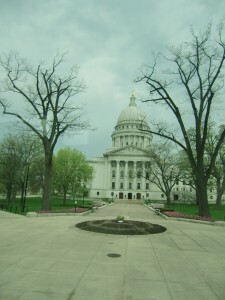 Nearby are the Greek columns and great white dome of the Wisconsin State Capitol building, extensive gardens of red and yellow tulips (more than we ever saw in Holland, Michigan’s tulip festival) bloom into the darkening sky, adding their brilliant color to the grayness of the day. In the village of Maple Bluffs we roll by many beautiful homes looking out on the lake, including the home of Scott Walker, the governor of Wisconsin. 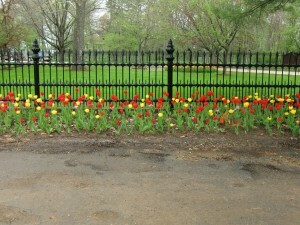 A riot of tulips bloom beyond his painted iron gate and fence. We pause at the University of Wisconsin, an eclectic assortment of old and new buildings and dorms. High on the campus is a great view of Lake Mendota. In the campus store we buy cheese from their great assortment and sandwiches. As we make our way back to the bus, a thunderstorm breaks. Blue flashes of lightning jag through the clouds and a deluge of rain pounds the top of our bus. The stragglers get soaked. We’re enveloped in rain as it runs down in sheets over the bus windows. Despite the downpour, we move on past the University of Wisconsin Hospital and the Unitarian Church designed by Frank Lloyd Wright. Rain sweeps over us with such intensity that it is difficult to see out of our windows. We pass the University of Wisconsin football stadium, called the Camp Randall Stadium because it was built on part of the site of Camp Randall where Union soldiers were trained during the Civil War. Finally the rain stops. On the way out of town, we have a peek at the gray-blue water of Lake Monoma. Madison is truly surrounded by lakes. Back on Highway 12 we catch a glimpse of another Ho-Chunk Casino, similar to the one in the Wisconsin Dells. The Ho-chunk Nation once occupied Wisconsin. In extreme southern Wisconsin, we pass through Janesville, a city divided by the Rock River. I t was once the home of the Ho-Chunk and Potawatomi Indians before they were forced to leave during the implementation of the Indian Removal Act of 1830, an act that opened up land to the settlers, another blot on our history. We zip through Beloit with its huge Hormel meat packing plant as well as Frito-Lay. Stopping at a pavilion over the freeway, we have all kinds of food available to us. It’s strange watching all the cars and trucks passing beneath us. The freeway we look down upon is the one that will take us to Chicago’s O’Hare Airport from which we will fly home. 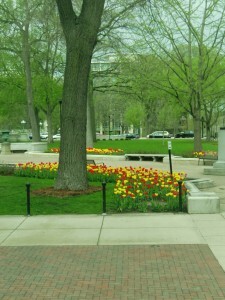 There are more tulips at the capitol than we saw in the "tulip capitol" in Holland, Michigan. 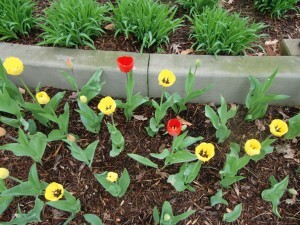 Finally, a close up of tulips to end our tour!